I’m an American baby boomer who doesn’t dance. It was an awkward social activity for a lot of guys in my generation and the excuse for not doing so was that I was always playing in bands –for other people’s dancing. The story is plausible because it’s partly true. But, somehow, there I was, salsa’ing mi cola off at midnight in Medellin, Colombia. 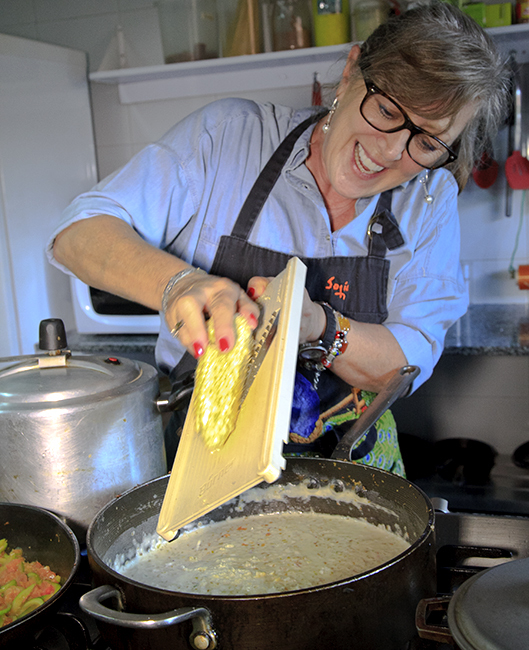 Arriving in the capital city, Bogota, in search of stories with my wife and travel partner Judie, Chef Sofia Samper whisked us like compliant egg whites off to a large local market. There she shopped for select delicacies to be incorporated into a custom lunch at her cooking school/restaurant. Music thumped in the background throughout the marketplace. During the subsequent lesson in Colombian cuisine at trendy Casa 95, Chef Sofia danced around her kitchen to an infectious Latin beat. And I began tapping my toe. The next day, Judie was working on one of her typically unusual Jewish stories. (She finds them everywhere. I won’t be surprised if, someday, we’re up on the Aleutian islands tucking in to seal blubber on a bagel with Akkikitok Cohen.) She was interviewing local community leader, Rabbi Alfredo Goldschmidt. He was warm, welcoming and very informative but, when time came to show us around the school he directs, he broke out an accordion and played us over to a classroom. I didn’t exactly walk ...it was sorta like the skip-step done to get back in sync when marching. 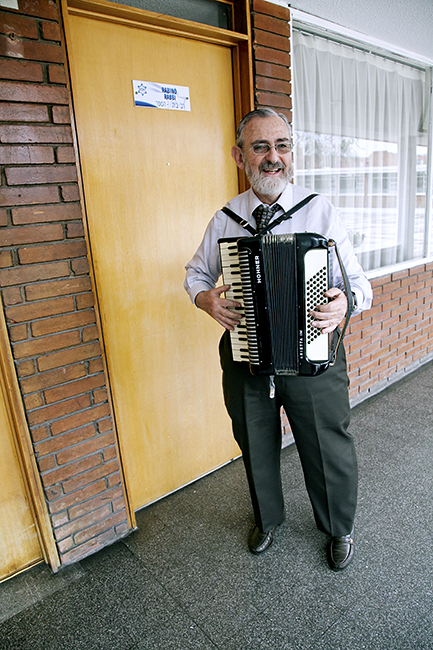 Rabbi Alfredo Goldschmidt on the accordion. 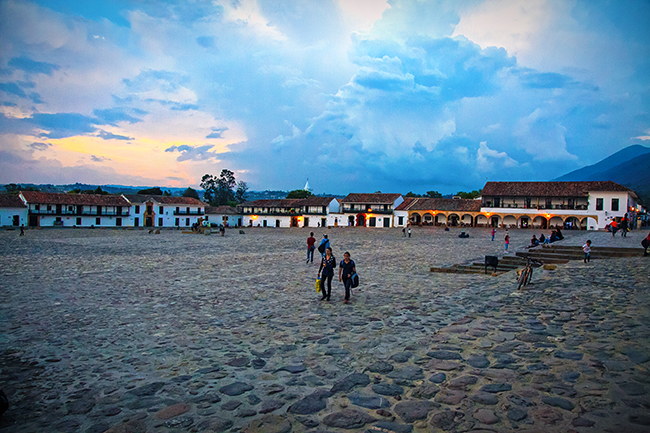 A few days later, on a brief tour of the quaint colonial town of Villa de Leyva, we paused to admire the massive plaza. Small groups of people gathered around local street musicians, and, while our guide spoke, I subconsciously bounced in tempo to the impromptu background score. Then we flew to Medellin. The very name still conjures up fearful visions of a violent history: death squads, political repression, and the Lord of all Drug Lords Pablo Escobar. But, it turns out, the dark legend is a, fortunately, fading shade. It would be much like mentioning Chicago to sophisticated European travelers and then watching them become wary of Al Capone. 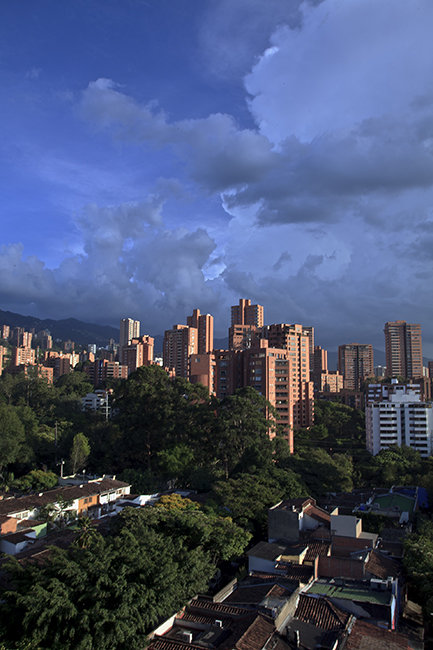 Modern Medellin is a thriving metropolis of three-and-a-half million with a big city skyline set against the dramatic, steep foothills of the Andes. Our first stop was once one of the worst neighborhoods in the bad old days. Not that far back in time, gangs roamed the streets and gunfire was exchanged between rival neighbors across a deep ravine. Even the police feared to venture there. Now it’s a vibrant community with stores, schools, a stunningly designed library and community center, and energetic life in the street­­–– all set to radios blaring a dozen competing songs. You can’t help but walk in rhythm. The change that created community had come about quickly thanks to transportation. The former near favela clung to a hillside, so near and yet so isolated from the city below that local residents would spend up to two hours wending their way down to work via a series of stairs, streets, and busses. Then, at the end of the day, they’d be forced to endure the same laborious journey back up the hill again. It was an inequitable situation that sustained poverty. That all changed with the installation of a cable car system which accessed the city in a matter of minutes. And, as for the cross canyon firefights, that was bridged by –an actual bridge. The evolution was hopeful enough to make you jump for joy. And I did, to omnipresent music, naturally. 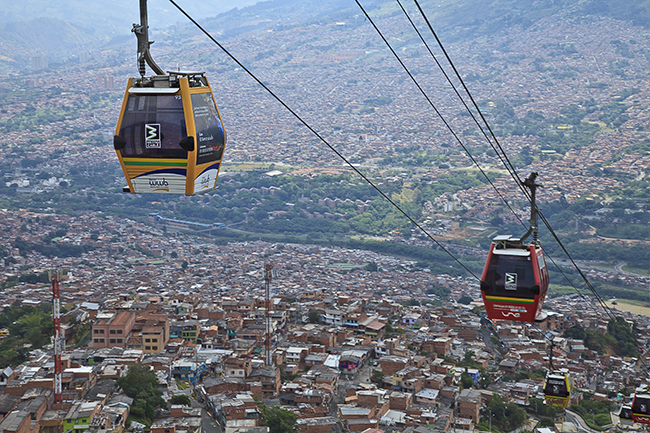 Cable cars over Medellin, Colombia. But somber shadows of history remain and we were enveloped by them during a Pablo Escobar-themed tour. Colombianos have mixed feelings about exploiting this true crime specter: on one hand, Escobar is a fact and tales of his bizarre life attract tourists while, on the other hand, they’d rather not keep refreshing the old, negative image. Meandering through the actual sites where the Escobar crime saga took place was, by turns, incredible, surprising, horrifying, depressing but, ultimately, up-lifting as we also saw how the nation has progressed into a modern and upwardly-mobile society. 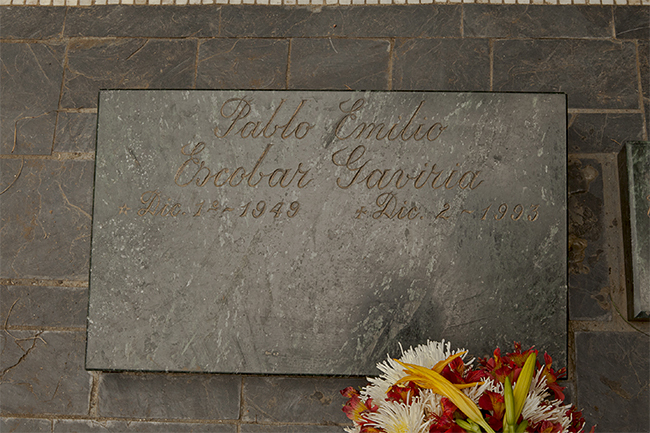 Tomb marker of Pablo Escobar. Along the way, my Spanish improved and I subconsciously incorporated the rhythm of the country. Spanish can be musical. Colombian Spanish definitely infuses even a casual speaker with a quickened pulse. In talking to kids on the street (many of whom speak English), I found myself slipping midway into street beat Spanglish. The harmonious cultural infusion continued through a series of tourist activities. We arrived in Raquira, a town renown for its ceramics. There, visitors are encouraged to throw pots, which in the hands of a novice, is a literal description. This craft requires a musical sense of timing. I didn’t have that so, to the humming pottery wheel, I added clumsy percussion. On returning to Medellin for a shopping trip downtown, I bought a souvenir charrasca (a scratcher percussion instrument). To everyone’s surprise, including my own, I ch-ch-chicked out a pretty good beat. 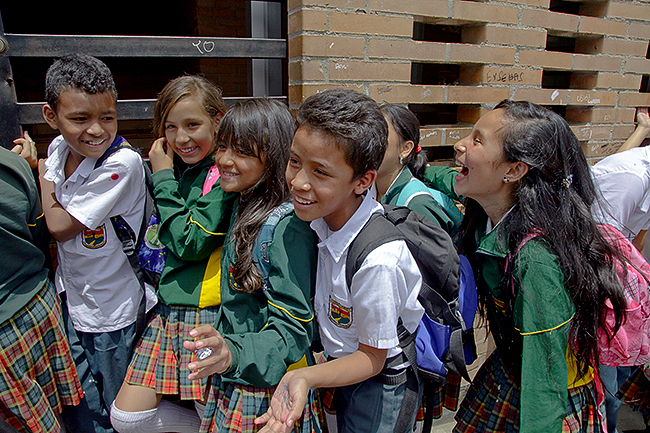 Medellin is an important business city with a large, young and affluent population. Throw in hip tourists who now flock there from all over the world and you’ve got party mix. Graffiti art colorfully splashes the city in artistic styles which reflect everything from pop culture to politics to you guess what the artist had in mind. Public art abounds too with the centerpiece being a square dotted with the monumental bronzes of internationally known Fernando Botero (a local boy). Accommodations in Medellin range from five star traditional luxury to trendy boutiques such as the Charlee lifestyle hotel with the best spa ­­––and, possibly, the best view­­–– in the city, including the parade of beautiful people who hang out there. Some exercisers plug in to iPods while others are content work it on out to the mix music pulsing through the hotel’s speakers. The hotel also sits atop the Zona Rosa with its blocks of clubs and eateries, each with its own sets of sounds: rock, salsa, jazz, fusion, house, etc., etc., etc. Not far are restaurants international in scope: Tramezzini (Italian), Mystique (fusion from an up-and-coming auteur chef), Herbario (gourmet health with a killer Scotch bar), Tabun (Middle-Eastern), Naan (Indian) and some that simply challenge classification. They all invite you to dine ...to music. The multiplicity of nightspots wasn’t limited to the Zona because there are clubs everywhere and at least one, local, semi-secret hideaway in every neighborhood. So, to get an insider’s sampling, we relied on our twenty-something guide Carlos Carmona. His English is good but his understanding of what we were looking for was even better. He surprised us by leaving the hot and happening Zona for the outskirts of the city. We climbed one of the sparsely illuminated hills that cradle Medellin and soon the darkness was blown away by a blinding light display, that featured a dizzying profusion of cartoon characters from Tweety Pie to Batman. 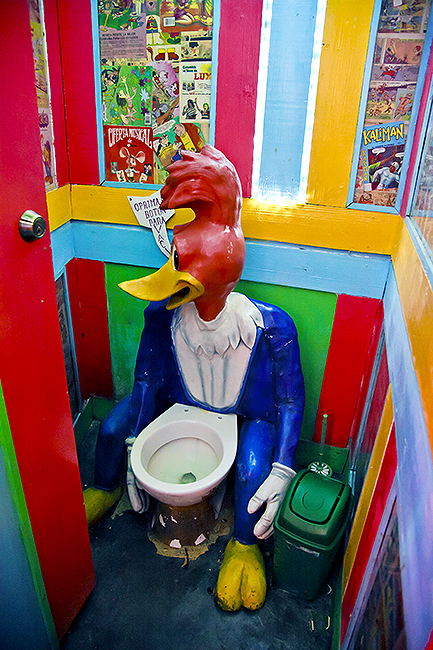 It was a club called Dulce Jesus Mio (My Sweet Jesus), a playfully confrontational mashup of comic characters and toys. Even the bathrooms maintained the theme: sinks in the ladies room had the water emanating from the anatomically-correct body parts of Tom & Jerry while, in the men’s, figures of Catwoman and Wonderwoman squatted to dispense. The DJ was good, the party was in full swing but it was too crowded. (A perfect excuse for me not to participate.) So we moved on. We next hit a neighborhood Rumba bar, also jumpin’ and jammed, before ending up at midnight in a joint called El Tibiri Tabara, an underground den for students and the working class, in the sense that it was below street level. In contrast to the pricey, upper crust and packed Dulce Jesus Mio, it was almost empty –but, in all fairness, we were there midweek and somebody’s got to work. Despite small attendance, salsa music rocked the joint and a vivacious duo sensually commanded the tiny dance floor. Soon the couple split, he to pull my wife into the action, she to engage me. Maybe it was the superstrong aguardiente I’d just downed but I really committed. I swayed my hips while keeping a strong core and barely moving my feet. I’d never been able to dance Latino before. Judie was shocked and delighted. We danced almost til dawn. I’m still not sure what got into me that night. But, I think, it might’ve just been Colombia.